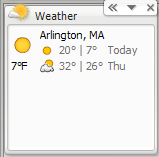 Why, it was just the other day that I was griping about the unnaturally warm weather we were experiencing this winter. “It’s a sign of the apocalypse,” I groaned. “Think of the poor ski resorts. Plus all the people getting colds.” That, of course, was before we woke up this morning to single-digit temperatures. And before I realized that the glass in my office is not well insulated—or insulated at all, apparently. Ah well. If it weren’t cold, what would I have to complain about? This is going to be a year without skiing for me, actually, for a number of reasons. So I guess the main reason I missed the cold was that I got acclimatized to it. Suddenly that’s not sounding like such a hot reason to want it to be cold. Um. I can’t feel my fingers. Brr. Ah, OK. The word is that there’s a damper stuck open in the heating system that is pulling cold air into the office. Perfect timing.